NAUGATUCK — Rebecca Lee Ferrari, 32, died unexpectedly on Oct. 11, 2018 at her home. Rebecca was born on Oct. 25, 1985, the daughter of Mark and Donna (Maida) Ferrari, and had lived in Naugatuck for most of her life. 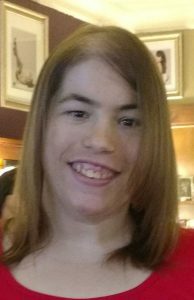 Rebecca loved working with her extended family and friends at Waterbury ARC, and she enjoyed participating in the Naugatuck Special Olympics. Her radiant smile and love brought joy to everyone. In addition to her parents, Rebecca is survived by her brother, Joseph Ferrari; her nieces, Alexus Ferrari and Bella Corso; her paternal grandmother, Betty Ferrari; her boyfriend of the past 10 years, Joe Magnamo; and several aunts, uncles and cousins. Rebecca was predeceased by her brother, Ryan Ferrari; her paternal grandfather, Nicholas Ferrari; and her maternal grandparents, Samuel Maida and Barbara Fedak. Calling hours will be Sunday from 1 to 3 p.m. at the Buckmiller Thurston Mengacci Funeral Home, 82 Fairview Ave., Naugatuck. In lieu of flowers and to honor Rebecca’s memory, contributions can be made to Waterbury ARC, 1929 East Main St., Waterbury, CT 06705 or to Naugatuck Special Olympics, 111 Dunn Ave., Naugatuck, CT 06770.